Not too long ago, Overdose.am’s own Sabrina Beek teamed up with photographer Sander Dekker and curator Carli van de Kerkhof. They were taking part in Foam Lab’s event ShortCut; an intense 24-hour expo challenge. Well Foam Lab is back once again. Proving all they’re worth in their last event of the year, this bunch is ready to go out with a bang. Confronting us with devilish acts we’d love to deny, it’s time to prove your own worth: Pics or it didn’t happen! The whole concept revolves around the idea of sharing (read: taunting) and missing out on one another’s killer experiences. We all know we do it; sending friends a snapshot of a beer bottle while you’re at the opening of the latest hipster ‘art’ gallery decked out in the swaggiest of attires you could scramble together last-minute. It’s a constant challenge, a way of keeping up appearances, a full-on photographic battle. The whole concept of Pics or it didn’t happen! revolves around this exact idea of sharing (read: taunting) and missing out on one another’s killer experiences. After having organized a ‘smartphonetography’ challenge for Lowlands Festival and hosting their last event in De Verdieping (just to name a few), they’ve ticked quite a few of the boxes on awesome locations and collaborations. For their final hour they’ve joined forces with the beautifully historic Museum van Loon. Who doesn’t want to party in 17th-century stables? Who wouldn’t want to act all posh and have a haute-cuisine tasting session in the traditional dining hall? And let’s face it, everyone’s down for some free Jameson. You are cordially invited, phone at the ready, to step into the realm. P.S. Yes, there is an afterparty. P.P.S. Feel like organizing awesome events and being a part of Foam Lab 2013? Find out how by clicking here. 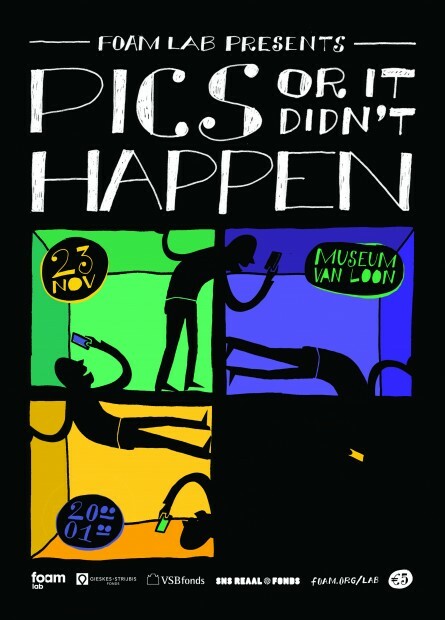 Foam Lab presents: pics or it didn’t happen! Facebook: Pics or it didn’t happen! Feature image by Maarten van der Kamp. Flyer illustration by Sharon van der Hagen.